Americans are going to need to transition from calling Canadians “Canucks” to the body snatchers. Yes it’s been one of the best weeks ever for Canada, particularly Toronto with the release of Drake‘s Nothing Was The Same and the city is determined to keep the memento going. Spearheading this Canadian takeover are three young women from Toronto with enough clout to garner the interest of A3C Hip Hop Festival organizers and enough love for the culture to proudly hold the title of being hip hop heads. This year, Brand Ambassador for A3C and writer Erin Lowers (Boi-1da, Exclaim! ), Music Editor Natasha Paolini (HipHopCanada) and Managing Music Editor Katie Sahlu (IX Daily) have teamed up to bring the North to the South. 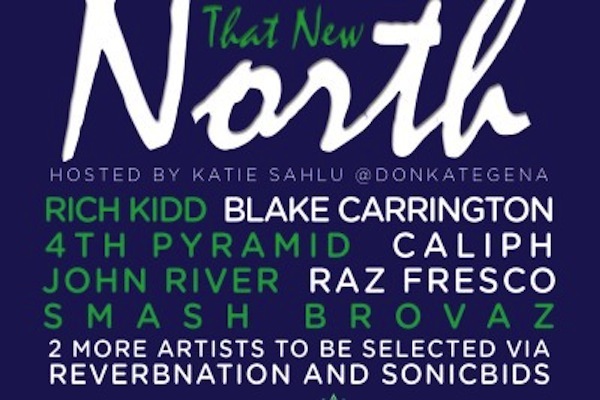 #ThatNewNorth, presented by A3c and HipHopCanada will feature an all-Canadian showcase with talents like Rich Kidd, Blake Carrington, 4th Pyramid, Caliph, John River, Raz Fresco, Smash Brovaz, Nostic and more set to perform. The ladies spoke with Bad Perm and discussed what the process of assembling such a high profile showcase was like. Erin initially got her start last year as a speaker for A3C’s Does Regional Sound Still Exist? panel. “Speaking on a panel with the likes of DJ Toomp (T.I.) and Curtis Harris (A&R at Atlantic) about this city… about what we have to offer, and having these same people nod their heads and understand that we have so much talent here made me realize it was time to step up. We have the support, we just needed a voice,” Erin says. “The festival wanted to run with the notion of Brand Ambassadors for numerous cities throughout the States – but nobody was up set up to represent Canada, so I spoke up. There’s probably people wondering “Why her?,” but the fact of the matter is that indie rap has been my bread and butter since I started in this industry in 2008. This festival is the epitome of what I love about hip-hop culture,” Erin said in closing. #ThatNewNorth will take place this Saturday October 5th at 529 East Atlanta Village, Atlanta, Georgia. If you haven’t purchased an All-Access pass ($60 USD) in September, or a Single Day Pass for $35 USD it will be $75 USD at the door. Tickets are available online.